The Cultural Foundations Learning Path is designed to help identify and bridge cultural differences using the GlobeSmart ProfileSM. 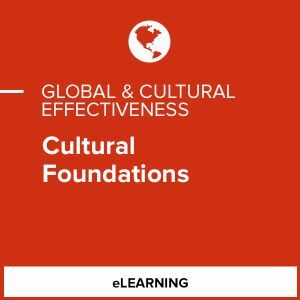 Gain an introduction to key cultural concepts and learn their importance in the workplace. Explore the five dimensions of culture to recognize how culture impacts everyday interactions. Observe detailed, real-world examples of different GlobeSmart Profiles to maximize the benefits of the application. The GlobeSmart Profile is a cultural self-awareness tool to be used whenever insight into cultural differences is needed. This product is appropriate for individuals at all levels of organizations.